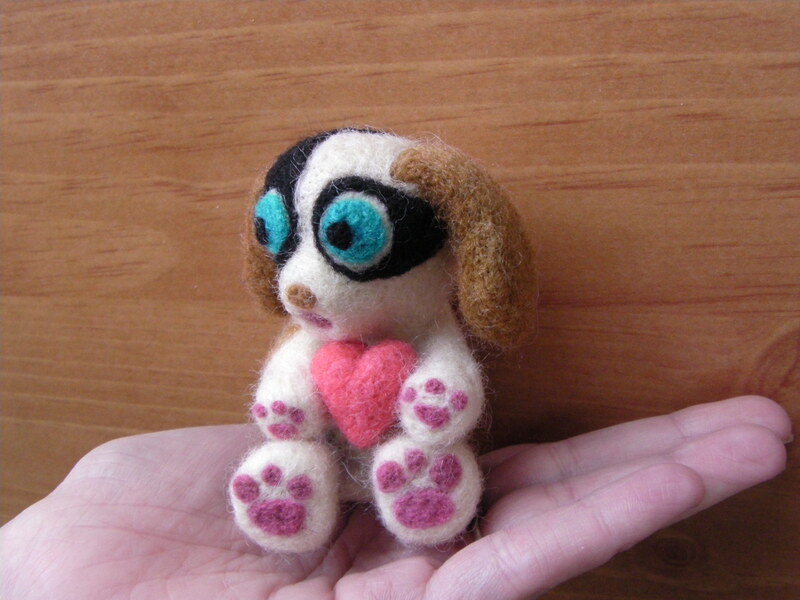 I have had a hard time with my past few needle felting projects. 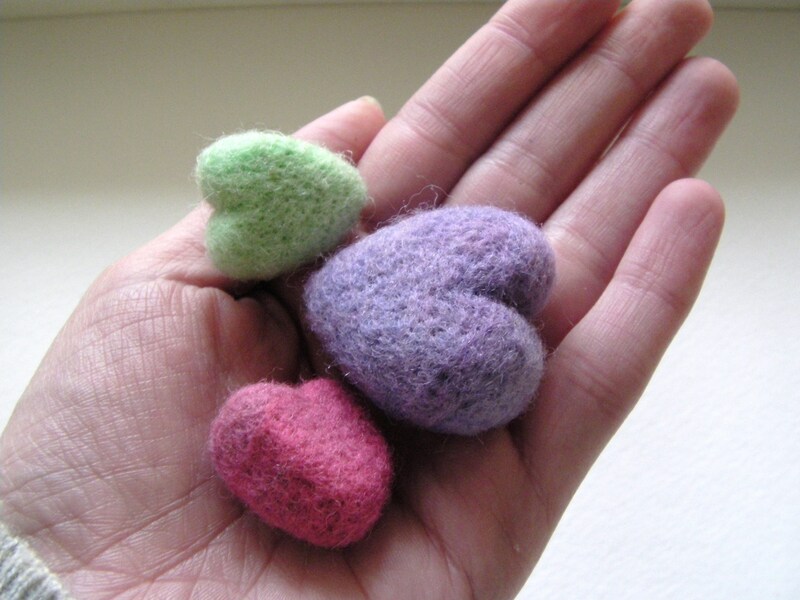 I couldn’t locate the correct size felting needle easily. I had ordered four packs of different size needles and through use I eventually destroyed the flimsy paper containers that they arrived in. 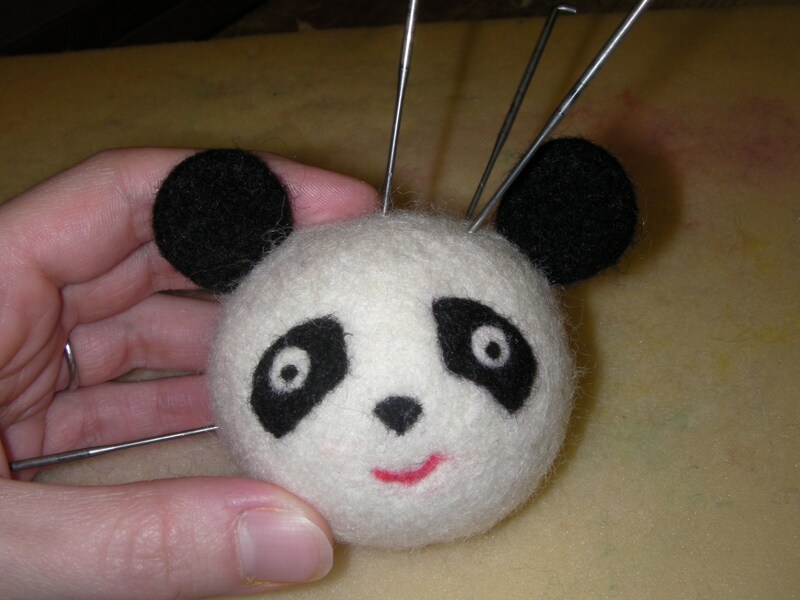 In needle felting, you start with a large felting needle to really get it going and then you size down as you work, in order to get the most finished product. And yet, my needles were all mixed up in the bottom of my container; making these last few projects very inefficiently produced. “Is this the right needle, poke, poke, nope!”, I couldn’t take it anymore. 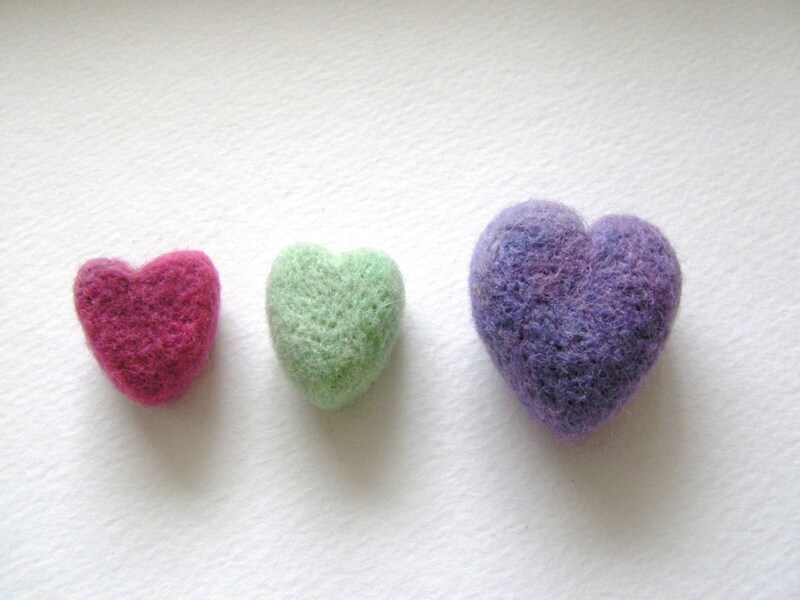 I have seen color coded felting needles online but I had perfectly fine needles if only I could identify the size! So I began my mission to identify and sort my 20 or so needles. 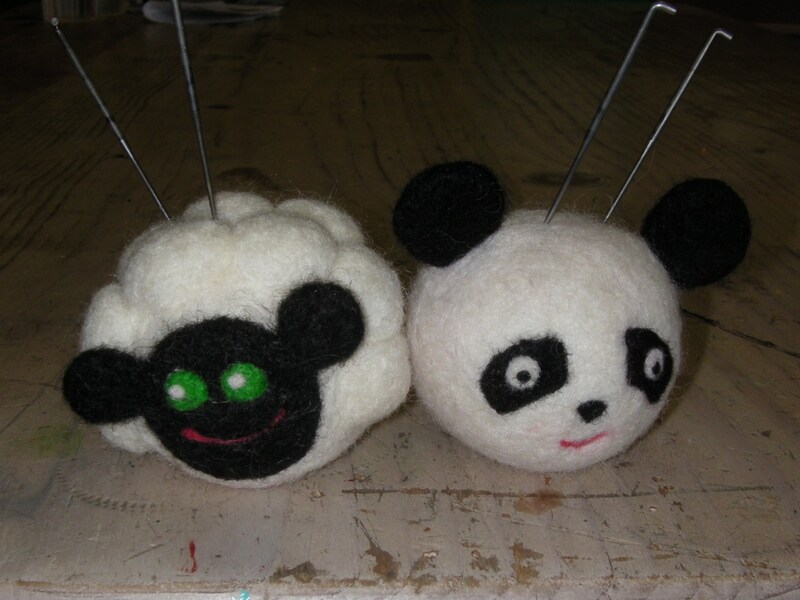 First, I grabbed two needles and poked them into a previously created felt ball(don’t use a super dense ball you will not notice the differences as well). I noticed which of the two needles did the most damage to the ball. I set the one with the most damage at the top of my foam pad and the one that did the least towards the bottom. 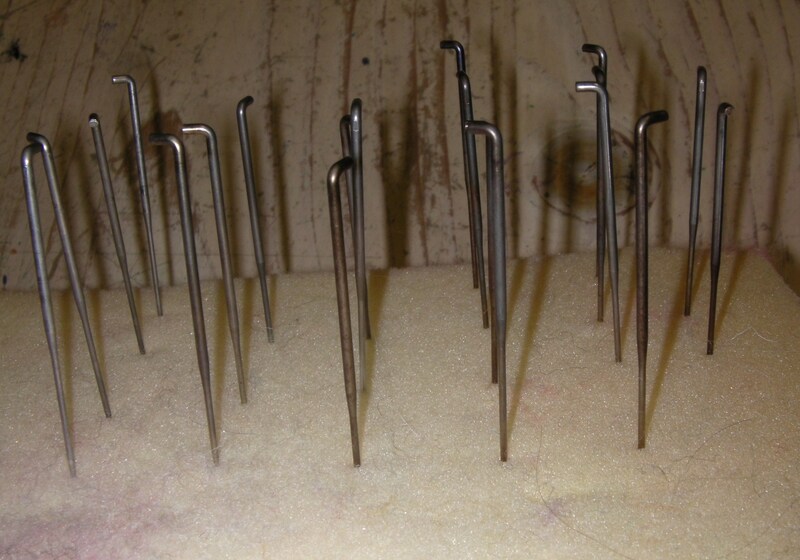 For the second two needles I compared them the same way, and then compared them with the first two needles. Obviously, if they similarly dented the felt ball, I set them side by side. 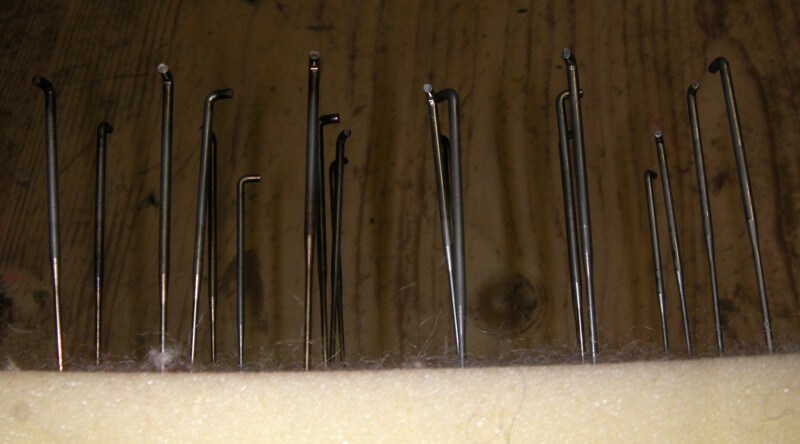 Eventually, I had 6 rows of different size needles. I double checked to see if the triangle ones and star-shaped ones were altogether, this is easily done by sight with a strong enough light and perhaps a magnifying glass. Finally, my needles were sorted; but I couldn’t put them back into their paper containers and I was afraid they would become lost or broke in the bottom of a plastic container. So now, I had a new challenge. Solution? 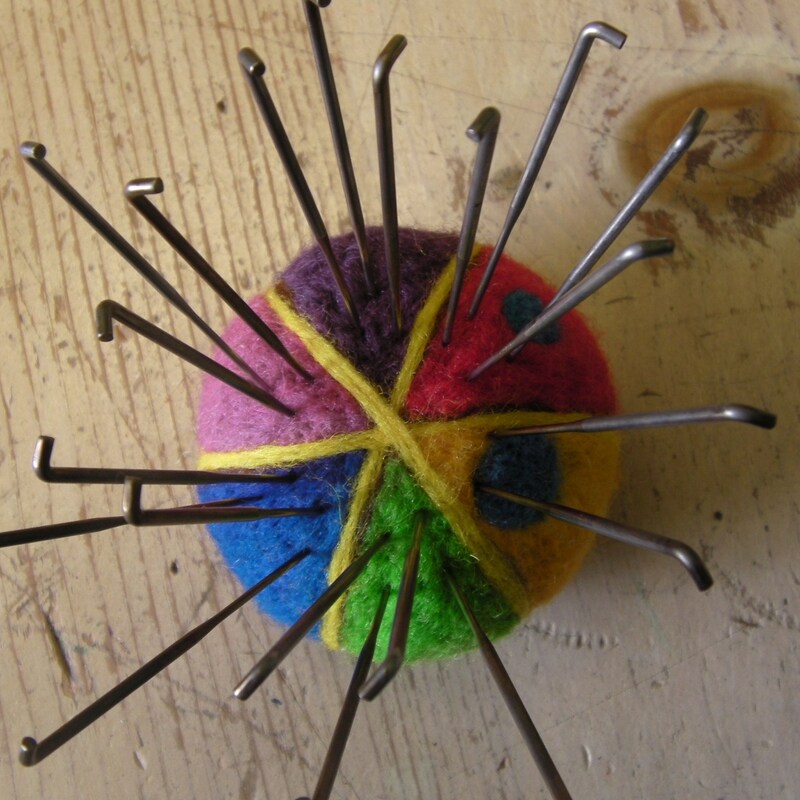 I decided to create a pincushion for my felting needles. I’ve seen people do this for straight pins and I thought this was my best option. So I grabbed a small felted ball(I have a stash to help me jumpstart some projects) and I used some scrap wool to make it a little larger. Then I split it into six sections, and felted a different color on each one; I didn’t felt it super dense, so that the needles could still do a little push into it for better storage purposes. Now I had a vivid wheel to place my felting needles on; the last step was adding a small dot to a section and a large dot in the section right next to it. 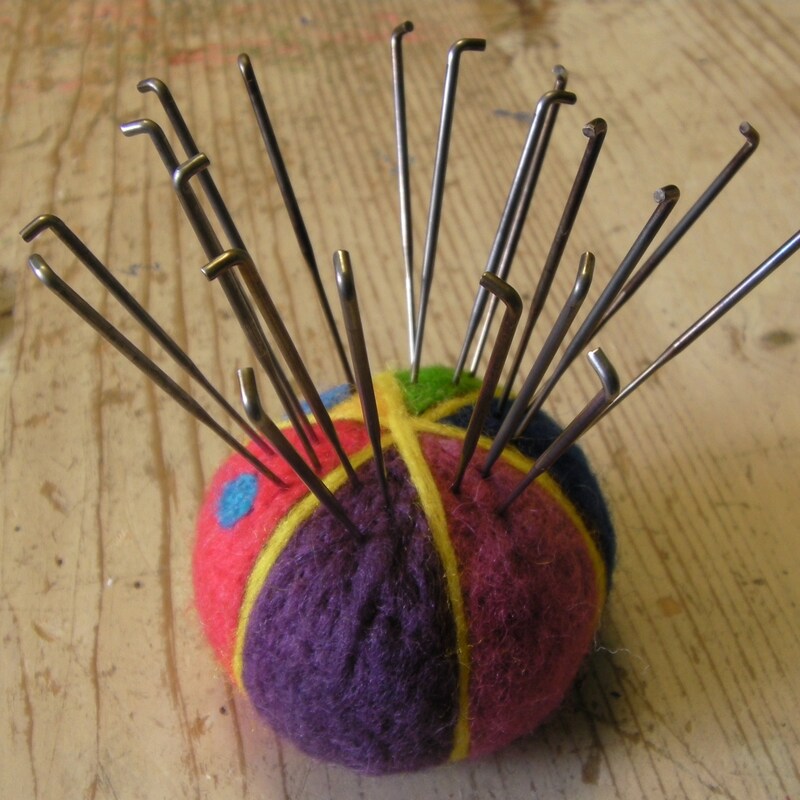 I started by placing my largest needles on the big dot and worked my way around the pincushion until I was placing the smallest diameter needles on the tiny dot. It was a success. It reminds me of a “circus clown” or a “beach ball”, but it’s highly functional. I can tell what needle is what. Now I have to place it on a super high shelf away from little eyes and hands. Success! Now my next toy should be much easier to create!